I was given a voucher from Clothing at Tesco after going to their press day a few weeks ago, A 25% off promotion came up and I knew it was the right time to use it, extra discount! And we all know I love my discount codes! I decided on this jacket because I thought it would be cool for the beach, however when it came I knew it looked good for day wear too. It only cost like £10.50 in the end which personally (even though I didn't pay for it, but would have if I didn't have a voucher!) think is a complete bargain. Its the kind of thing Topshop would charge like £45 for! The review "Not quite what I expected, more suitable to an older person" made me laugh, It is quite "old person" but in a hipster kind of way! I always find clothing reviews on websites funny, mainly because I think fashion is really subjective, like one persons trash is another persons treasure. I see alot of clothing companies are introducing the "review" thing on their websites and I just dont get it, When it comes to quality and stuff like that fair enough having a bit of a review, but most of the time when I read them they are about the style of the item, how the colour looked funny on them or how a item didn't suit that person. I guess I find it a bit defunct because we aren't all the same, sometimes things don't suit me but look fab on someone else. So I don't REALLY get the usefulness of a "review" of a clothing item! PS. I am wearing hotpants under the tunic, you just cant see them, no indecent exposure for me, before you comment on how truly scandalous I am! PPS. God my hair looks ridiculously orange here, I can assure its not. Cannot wait to get rid of the Ombre! Love that your nails match your ring! Super cute. I totally agree with you on the review section that clothing stores are bringing in online, I just thought 'how random' when I first saw it and ignored... I'll judge from the picture whether or not I'm interested in buying! You're right about topshop charging £40 for something like that, it does look similar to something they'd sell so deffo a bargain there. Nice paired with all black too, I see some ladies wearing leopard print head to toe in town sometimes and it really puts me off it but in small doses it can be fantastic. Yeah the review thing is'nt for me either, they don't benefit me at all really. me encantan los collares de las cruces de forever21! Oh wow, it's so gorgeous. You're right, Topshop would charge the earth for something like this. You outift looks great, as per usual,but I feel like I have to comment on the nail colour. It's so lovely! I'm kinda over leopard, after using it and busing it during my "scene" years, but you do it nicely, it's not as obnoxious giving how understated the rest of the outfit is. And why in hell is looking like a bad person a bad thing? My grandma has some of the most amazing clothes I've ever seen. Love this!Your so right about reviewing!p.s I need your cross necklace! I like your hair, actually. Is that wrong? Haha. I'm also a fan of the print. As if they've started reviewing clothes now. Sure it would be useful if we all looked the same but the fact is we don't. And you've completely subverted these bad reviews, by making that jacket look so stylish. It's all about what you combine things with and you've definitely pulled it off! That review is pretty amusing. I think you look beautiful in the leopard print. And your hair looks great, but I also can't wait to see what you desire to do with it next! 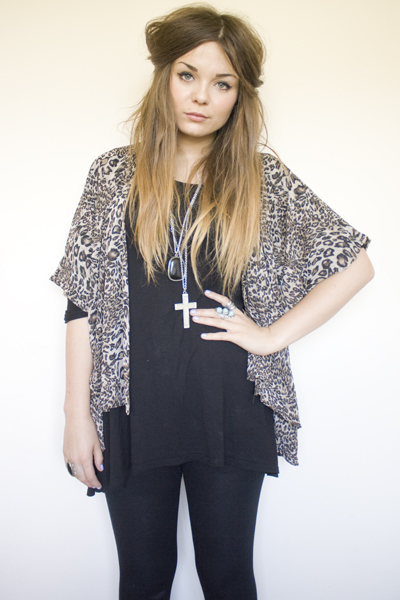 I love the outfit, simple but effective, the rings are lovely too, i may have to invest in some come payday! I totally agree about fashion being subjective too - no one really has the right to judge! Tesco are like Matalan, they've seemingly snuck out of nowhere to grab a slice of the action. I love that jacket! And you are right Toppers would have totally charged a heap more for it. Looks great with simple black styling. I used to work at Tesco and never would've guessed that this was one of theirs, I love it! Loads of brands seem to be upping their game lately, Topshop, beware! you nails look super nice! Loving the docs! I can't really pull them off personally but they look ace with your outfit. Really love your dress too! Such a nice jacket, it really suits you! Jacket looks amazing on u!I agree with the clothes review. I don't get it. bargain hunting is definitely the best! OMG! I wish we were friends so I can borrow accessories from you! haha you have a lot of awesome stuff!!! great look. perfect for day too, you're right. the reviews are funny. i mostly read them to find out about the fit. i love this whole ensemble! 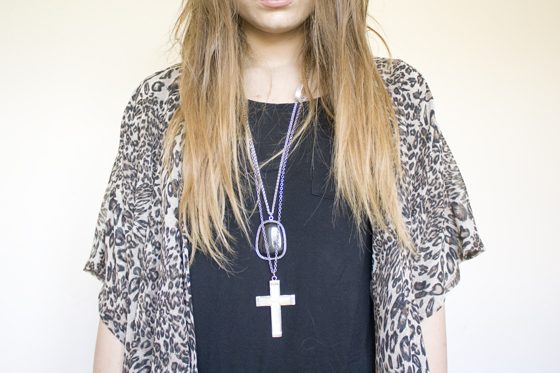 the animial print and the cross necklace and rings. Gorgeous! I've got to say, this is one of my favourite outfit posts from you. 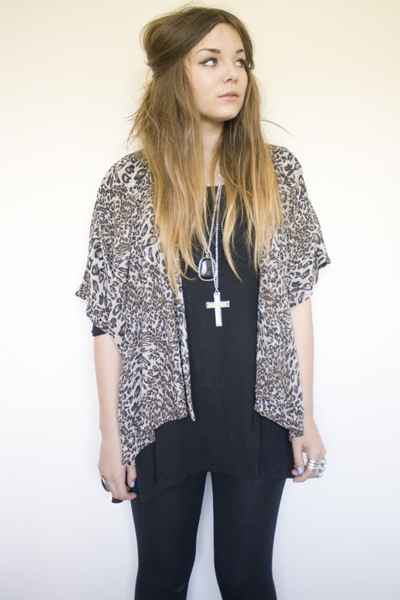 Just the right mix of grunge (crosses) and glam (leopard). Great mix! I love these colours with your hair! I love how it all combained together, it looks great. And about the review, I totally agree with you on this one. Reviews are usually followed by trend, but I think peopole should realize not all the peopole love to follow trend. Some peopole just go with what they feel. I know what you mean about the reviews on websites, though I think they can be quite useful; they've often made me think twice about buying something! Your hair has got sooo light! I think it looks fine though, especially as we're in summer. Not sure what summer yet, but if the sun ever does show, your hair will look great! did you decide whether you wanted to go back to brown or blonde? either way, it'll look lovely! I absolutely adore the rings, they're amazing!